It can be a real pain sometimes to travel to new places through Indian Railways. Is your train late, when will it start, when will it reach, is there a hotel nearby your destination, how is your arrival and departure station, do they have good food and a good rest room or heaven's forbid... did they cancel your train at the last moment! Fret not, because you don't need to dial the inquiry number of Indian railways and deal with the automated machine to get these details each and every time. All you need is a smartphone in your pocket and an app installed in it by the name of RailYatri.in and all you want to know before going on the station, during your journey and even after getting out of the destination railway station is available on your smartphone. It has a few limitations which we will discuss at the end but before that let's see how this app can help you with your journey through Indian Railways. Before we proceed let me tell you that it is available on Android and Windows phone platforms with the Android version having much more features than the Windows one so we will be focusing more on former. For those with iPhone or any other mobile with an Internet connection they can use the mobile version of the site m.railyatri.in to access its features. 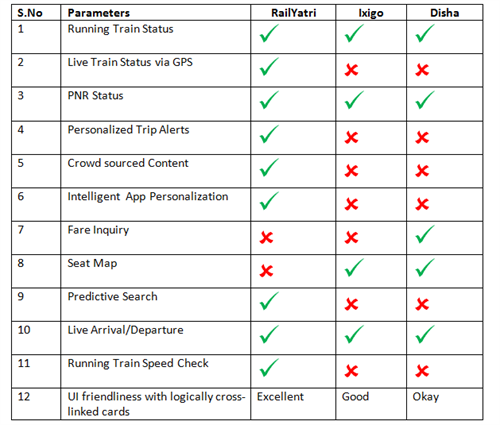 Here is a comparison between the features of the RailYatri with few of its competitors. Other than these, it is noteworthy that RailYatri.in offers better personalization options than both these services. In RailYatri.in you can store nearby stations, live station status, directions to the nearest station and even SMS subscription for any updates on your train. Live Train status- With this you can see where your train is presently. If you are not on the train then it will tell you the data from the railway servers telling you the position according to the stations your train will be crossing. If you are On the train, it will use your smartphone's GPS to track your position real-time. Live Arr/Dep @ Station- We found this feature to be of great use for travelers. You can at real time see which trains are arriving on the station, which are standing on it, which are scheduled to arrive and also when they will be departing. GPS Train Locator- This does what your Live Train status feature does with the GPS. If you are on the train then you can find your real-time status. Speed Check- If you have used an app for map navigation while real-time driving then you would know what I am talking about. Using GPS it tells the real-time speed of your train and compares it with the usual speed of your train to let you know if you are going slow or fast. It is not something I would suggest you to rely on entirely because there are huge variations in a trains speed due to many variables like availability of tracks. Even if your train is running slow for a few minutes or hours, they still have the ability to make it on time by increasing the speed later. RailWisdom- A featured feature of RailYatri where they crowd source the information about individuals platforms and curate it to provide you the best information about a station. Special food items, nearby places to visit, trivia about stations, nearby stations, live station status, directions to the nearest station.... whatever you might find interesting about a station is crowd sourced from RailYatri users at one place. Time table, PNR status and Trains between stations- These are features I am sure you are quite familiar with. Get the time table for a particular train, get details about your PNR status see the trains available between stations using these features. Search Alerts- This is a useful feature if you are trying to book tickets on a busy time when it is difficult to get a reservation or if you have already booked a ticket and would like to get details about a train. You can see alerts for the station or a train. Though the train alert would only be useful if it is late or cancelled, the alerts for station can be quite useful as it gives you information about special trains leaving that station or extra seating capacity being added to a train on that station. Another feature I would like to mention is the Platform locator which is available on their mobile site. It can be quite confusing and sometimes harrowing to find the right station for your train. This feature takes that tension away from you by updating you about the platform your train is on so that even before you get inside a station you know on which platform you have to go. RailYatri.in offers a great service to subscribe for SMS alerts for a journey you have planned through train. It informs you regarding any delay, rescheduling or cancellations of your train by way of free SMS alerts. Great, isn't it? Well, not all is perfect with RailYatri.in by the way. There are a few things that require improvement as soon as possible so that we can really start trusting the service. Inaccurate- In its Android app on the home page, the Current nearest station it is suggesting is around 42 kms away whereas the nearest station is actually just 5 kms away from the place I am right in! The station near my house might not be that big but it sure is a listed railway station and RailYatri app should have been able to show it to me. Incomplete- It is directly related to its RailWisdom service. As it depends on crowd sourced information it is quite understandable that it does not have much or any information about small stations where normally not many long running trains stop. For instance, it did not have ANY information about my the station near my home. All it was showing was other big stations near mine. No sign-up option except Facebook- Yes, you read it right. To be able to subscribe for services like SMS you can sign up only through a Facebook account. So, if you don't have Facebook account then you can use the limited features it offers or you might need to create a new Facebook account just for the app. The reason for this has been given that they want to "personalize" your experience by getting 'some' data from your Facebook account. So, if you don't trust a new service with your Facebook account then its definitely a big dampener for you. Android focused- I carry a Windows phone and frankly I found the limited features on it quite disappointing compared to the features on its Android app. It will be even more disappointing for iPhone users. Let's hope they push out upgrade for the Windows version soon to make it as useful as its Android brother. A little correction. The app now has fare enquiry Service after recent update. However, it does not offer fare details for passenger trains.